Darlington's Stu Hall has said age will have no bearing on his defence of the IBF world bantamweight title against Paul Butler in Newcastle on 7 June. Hall, 34, is nine years older than his Ellesmere Port rival, although just one of his last five opponents - Vusi Malinga - was older, by three months. Unbeaten in those five bouts, four were wins while his last outing was a technical draw against Martin Ward. 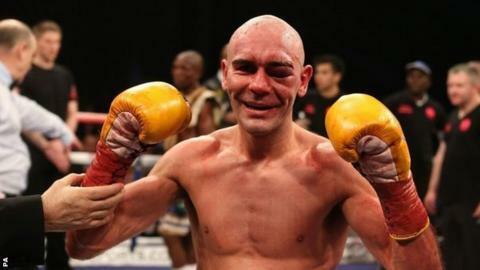 "I've beaten world-class fighters, age is just a number," Hall told BBC Tees. "Paul Butler has never been in with someone like me. He thinks I'm going to get a shock but he's going to be the one who gets a shock." Butler is stepping up a weight division in taking on Hall, and possesses an array of inter-continental and commonwealth titles from his spell in the super-flyweight division. "He's a threat, I don't think he's taking me seriously but I'm taking him very seriously," Hall said. "I'm just concentrating on what I do best and then once I'm 100% there's no bantamweight in the world beating me. "Never mind a super-flyweight in Paul Butler." The press conference announced to promote the fight last month ended with words from the Butler camp that Hall described as "disrespectful". As with Carl Froch and George Groves' imminent contest, social media has provided a backdrop and outlet for comments, some less than complimentary. "They're building themselves up for a massive fall," Hall added. "I just laugh at them, I'm humble and will concentrate on what I do and I'm happy to be defending my belt in the north east. "If people try to upset me on Twitter, I just block them. I've got no room in my life for negativity, I'm a positive person - I see the tweet and it's gone."